Cardinal Luis Antonio Tagle of Manila urged Filipinos to spend the week not only as a break from work but also to reflect on the humility shown by Jesus in his suffering and death, ucanews.com reported. “While we also get to rest during Holy Week, I hope it will not remain merely as a break or vacation rather than a time to deeply know Jesus,” he said. “I hope those of you here will inform your children, grandkids, relatives, friends that Holy Week is a time to look at Jesus. Listen to him, allow his words, his sufferings and love to transform our whole being,” he added. “I call on you, my dear faithful, to enter more deeply and spiritually embrace the meaning of our Lord’s Passion, death and resurrection,” he said. 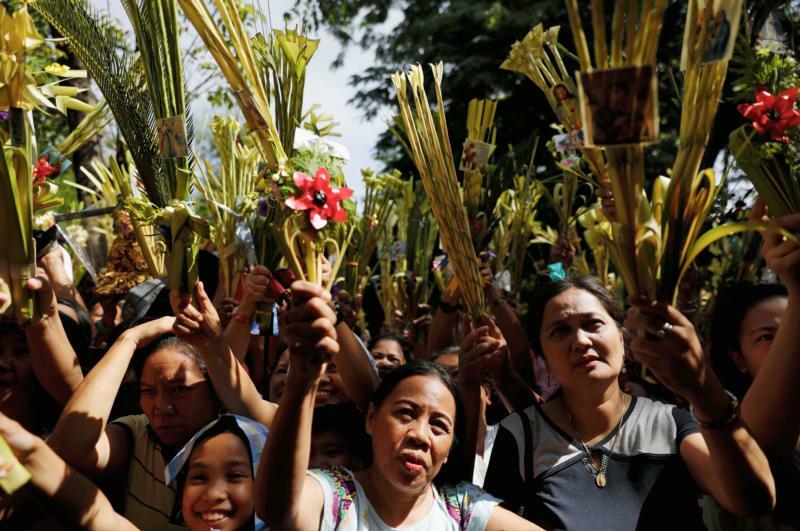 In his homily during a Palm Sunday observance, Archbishop Jose Palma of Cebu also reminded the faithful that the Holy Week is a time to reflect on God’s love for people. “Let us pray and open our hearts through our active participation in church activities because we have a lot to do,” he said. The campaign for the national and local elections in May has entered its final phase as candidates have tried to meet voters around churches during the Lenten season. Cardinal Tagle reminded the faithful to choose to become followers of modest leaders like Jesus, even if doing so is not easy. Bishop Jose Colin Bagaforo of Kidapawan, on the southern island of Mindanao, appealed to candidates to declare a “campaign cease-fire” during Holy Week. Father Edwin Gariguez, executive secretary of the social action secretariat of the bishops’ conference, reminded candidates and their supporters not to campaign in churches. The national Commission on Elections has issued an order banning campaigning on Holy Thursday and Good Friday.